The new A320neo from Airbus is supposed to be the company’s next-gen 737 competitor, it’s new plane when it comes to mass-market airline travel. 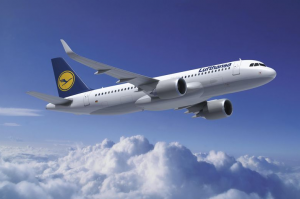 Launch customer Lufthansa announced last week that it officially received the first production A320neo from Airbus, which doesn’t look all that different from the plane that came before it, the A320. Well, the A320neo is pretty much the same as its predecessor save for its new engines, higher fuel efficiency, and emphasis on being less noisy. The A320neo family encompasses three different sized aircraft, the A319neo, A320neo, and larger A321neo. At the moment, Airbus says it’s booked around 4,500 orders for the A320neo family in total.